The lovely Colleen Taylor and Ben Wilson of Wilson + Taylor called upon me last week to help with a couple of ads for Blackhawk Hardware -- my maiden voyage in designing for a shopping cart! 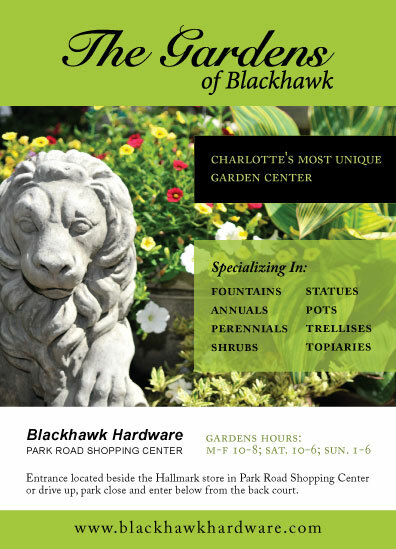 These ads will be displayed on the carts of the Harris Teeter at Park Road Shopping Center, where the amazing Blackhawk Hardware is also located. This store has an incredible reputation for style, selection and service and our ads managed to reflect its upscale, high-style personality. The ads feature photographs by Ben (styled by Colleen). Blackhawk's owner, Jim Wilkerson, loved the ad so much he decided to extend the ad campaign to all of the shopping carts in his own store. He came up with an idea of how to custom-build frames for his own carts.